For the past 10 years KAPM-Jandee Anesthesiology Associates have been servicing the greater NY and metro NJ area. KAPM-Jandee Anesthesiology Associates board certified anesthesiologists practice in 12 locations and have over 100 years of experience combined. KAPM-Jandee Anesthesiology Associates specializes in the practice of anesthesia for ambulatory and cosmetic surgery and dedicated to the practice of pain management and office based surgery. KAPM-Jandee Anesthesiology Associates are committed to adhering to the strictest safety regulations to ensure their patients receive the highest level of care in a comfortable setting. Dedicated to safety and adhering to regulations KAPM-Jandee Anesthesiology Associates offers their client’s consultative services to help implement, prepare and maintain protocols for accreditation surveys. Jennifer the nurse made me feel very comfortable from the very beginning of the procedure. She was warm and professional at the same time. The staff was very friendly and put my nerves at ease. So friendly and kind. Helped me relax before the procedure. It was one of the best experiences I have ever had with sedation. Thank You! The anesthesiologist was warm and reassuring, yet extremely professional. He monitored my condition, provided the perfect amount of sedation for my procedure, and most important-- he accomplished what he promised-- my pain free experience. Thank you so much! You, Dr. Song are the nicest doctor I have ever met. I hope I do not need you again but I will certainly recommend you to others. I always felt like I was in good hands when I got the shots. A Huge Thank you! I appreciate that I was sedated enough to be unaware of the procedure and awoke as if I was awake the whole time. 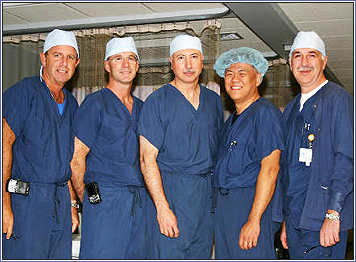 I experienced professionalism from the time I arrived to the time I exited the surgery center. A special shout out for Dr. Robinson, Dr Mindy and Dr. Wong. Also Nurses Jerico, James and Kathy are friendly and professional. Dr. Song was very pleasant and fully explained everything, was very sensitive to my needs. Paul Gordon, the anesthesiologist, was wonderful! His pleasant, friendly manner certainly eased my anxiety. Overall, my experience at the center was quite good! Wonderful experience. Very nice group. Highly Satisfied. Very Kind, knowledgeable staff.